Compassion International - Buy a Goat! Part of the American dream is achieving a higher standard of living for each new generation. In order for us to share our wealth, build global markets, and help the next generation of the world's poorest accelerate their market participation opportunities, we can invest in them in simple ways. While people can benefit from charity, a better solution is often to make captial available to those who cannot access captial on their own. And the best capital is often that which allows children to grow up and have more opportunities than their parents. By meeting some of a poorer families' most basic needs in a personal way, income they generate from work can be employed as they think is best for them. In much of the world, owning livestock to provide ongoing nutrition is often a beneficial milestone in being able to support a growing family and family-run businesses. 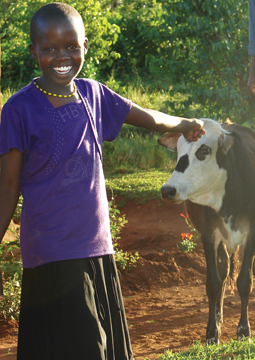 Also, children learn valuable work skills by caring for a family's livestock. To help build opportunities for those with less capital, we encourage our clients, colleagues, and friends to consider buying livestock for a family in need. Do that by clicking here.